At #nextlibrary2015 I did an Ignite talk about global librarianship. I shared the vision that in a world where countries compete on knowledge to get knowledge jobs – life long learning is valuable. Therefore libraries are more important than ever. We need to know how people learn, unlearn and relearn – and we need to have our own agenda about how we learn on a global level so we can be one step ahead as information professionals – and be even better to support the learning of our communities. By being inspired globally we learn different answers to the challenges we all face as libraries – and we can translate our inspiration into acting locally in our communities – to make our communities smarter. The examples I shared was Buy India a Library where four information professionals (Including yours truly) set up a crowdfunding project to build a library attached to a school in Mysore, India. More than 100 wonderfully generous people from all over the globe supported our effort – so though we (at that time) we enabled people to fund a brand new library. 23 Mobile Things took the inspiration from the original 23 Things project and transformed it into a learning program for information professionals with the scope to explore the potential of mobile tools for delivering library services. It was a local project for the staff at Guldborgsund Public Library and we then turned it into a global learning project in cooperation with State Library of New South Wales (with my wonderful colleagues Mylee Joseph and Kathryn Barwick). Today there are several English language versions in USA, Australia / New Zealand, Singapore and the Philippines and versions in German, French, Russian, Norwegian and Danish. Thank you for feedback to everyone at Next Library – and thank you to all the people I connected and learned with and who shared your time and knowledge with me. The Ignite presentation format is very challenging. 5 minutes – 20 slides advancing automatically after 15 seconds. How to use social media for collaboration, inspiration and changing the world will be some of the tracks of our talk. Including a small how to – and facts about the project and the library in Mysore, India. What can you learn from what we did with this project? That is what we will try to answer. We did this using social media without ever meeting in person. In fact the first time I will meet one from our team is the day before the presentation when I meet Justin in Hamburg. It is not a rare thing to work remote with people you never met – but to gather a team (Justin, Andromeda, Ned, Jan) and fund a library in another country in two weeks. I’ll say that is really something – and the take away is that when we could do it – you can do it too. It’s hard work but it is possible and it is easier than you think. Libraries are closing all over the world but we just opened a new one funded by awesome people who know that this library will make a huge difference in a local community in India and give children from Mysore, India an opportunity to get important literacy skills and thereby empowering them to live dignified lifes. This project is an example of egoless social media. Connections matter and because of the connections we made and facilitated, people from all over the world gave Mysore a physical library. Once more, and I can never say this enough, thank you to all those who donated and those who shared what we did. The library is yours, it is ours but most of all – it is the people in the Mysore community that benefits from this library – Just like it should be. A few thoughts about transparent leadership. I like the idea but it is often impossible. There are a lot of things to consider when dealing with people so I won´t be able to share every detail – to protect the innocent – of course. But hey – you don´t want them anyway. After being sick Tuesday and Wednesday I had a lot to catch up on. We have a vacant position in the children’s library. I had some meetings with children’s librarians about this. Some meetings about staffing reference desk issues. We are weeding the collection very hard right now. This called for two short meetings too. I also had a meeting in the leadership group. Interesting times. – and general making to-do list smaller because I am on vacation next week – YAY! I added a few pictures to flickr – most of them pre – work. Check them out. Do you know about the international library conference Cycling for libraries? They will visit one of our branch libraries and our main library. I am looking forward to receiving library people from all over the world and hosting a part of this great event. I have been in contact with local hostels to secure accommodation for the 100 people participating. Yesterday I received the final confirmation. So why is the idea about a conference like this so great? Read my greeting here. Follow the #cyc4lib hashtag on twitter. A few emails to the other members of the #buyalib team. We are very excited about continuing the project by donating the collected money and thereby laying the first bricks for the library. We are working on a plan for getting info from the library to blog about so all you awesome contributors and supporters can follow the project along with us in the future. This is a spare time project so also thank you to patient wife and kids. Well Iron & Wine is still playing here. 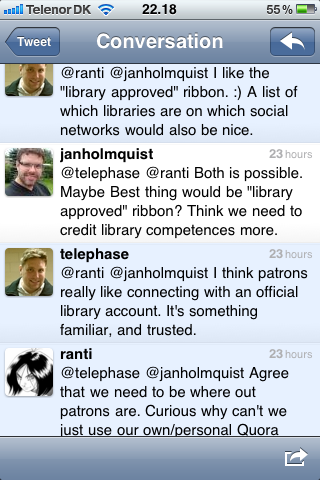 I´ll leave you with a few tweets I found interesting last night about libraries and Quora. Well is this the way to do it guys? Thanks @telephase and @ranti for a great discussion. I want to share what I learned so far from working with amazing people I only met on Twitter for the cause of funding a library in India. We collect funds via social media on our blog. I hope you will support the good cause. First let me say that it is easy to collaborate on a project like ours using twitter, emails and wordpress blogs. Of course It takes a lot of time but a project like this would also take a lot of time if it was made by people sitting in the same room. We are four people in the group. Ned Potter who is an academic librarian from the UK, Andromeda Yelton and Justin Hoenke public librarians from USA and I am a public librarian from Denmark. What tools have we used to communicate? We use twitter and emails for communicating. Direct twitter messages when in a hurry and Emails for longer messages about plans, strategy and status. We use our spare time and we have families, so sometimes one of us has got a lot of time to put in this project, at other times we obviously don’t – But I am amazed by how far we gone in very little time. It is obvious that it is important that you give what you can and that the others respect when you have other plans. We never spoke about this, it is kind of written between the lines, but I could see the need for some rules in a bigger and longer lasting project. I have been so lucky to have a Skype meeting (and one more to come) with Buffy J Hamilton. This meeting was not related to the Buy A Library project. We talked about libraries in US and Denmark and about transliteracy and the power of libraries worldwide. I feel lucky to live in a time where it is so easy to share and communicate. Libraries are more similar across the world than I thought a couple of years ago. What it all comes down to is that we provide access to information and knowledge via all types of media. In some countries the main media is still the book, in others countries there are a variety of important media – but we provide access and support learning and (trans)literacy. That’s why I am a strong believer in the power of libraries. What tools have we used to promote our campaign? Our campaign lives on our blog and started as a twitter project. Our followers (and a lot of non-followers too) have been very kind to us helping promote our campaign and supporting with funds. Rosanne Cash who loves libraries supported us with a RT, and she has got more than 17.000 followers – Things like this make a difference. Thank you, Rosanne! We learned that blogposts supporting the cause made a difference. We can see that in the donation status. We asked others to blog about our cause and have been getting good response… And you can like us on facebook. Please do. So what to do now? We will countinue to collect the funds needed for building and funding the library in India. Then we will evaluate and I hope we will have reached our goal so we can celebrate as well. I really like being in this project. One reason is because it makes a difference and builds a library. How awesome is that? Libraries are closing all over the world, but we are opening one. It’s nice to learn that librarians and library supporters are so generous and the support for our project is amazing. Last but not least it is a great group of wonderful people I teamed up with. I am working with the best and if that does not motivate – what could? I already learned a lot from participating in this project so far – and we are not finished yet. I want to use what I learned to collaborate with even more of you amazing people. I hope you will have the will, the time and ideas to work with a public librarian from Denmark. We could share ideas and thoughts about libraries in different countries or set up Skype meetings with patrons from each of our libraries. I don’t know yet. Maybe you do. I know that when this project ends I will invite you to come work with me via social media and of course you are all welcome to visit my library. Libraries and their communities – an interview. 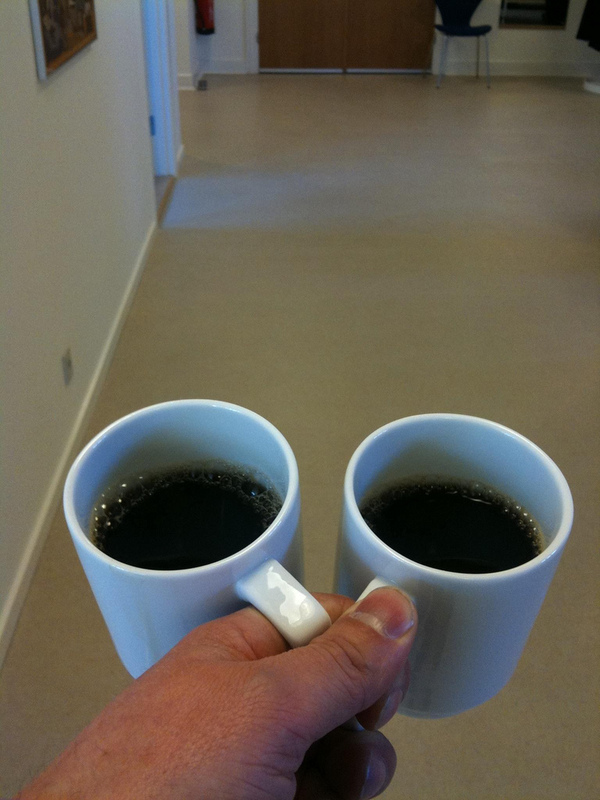 Open libraries: Self service libraries - The Danish way.